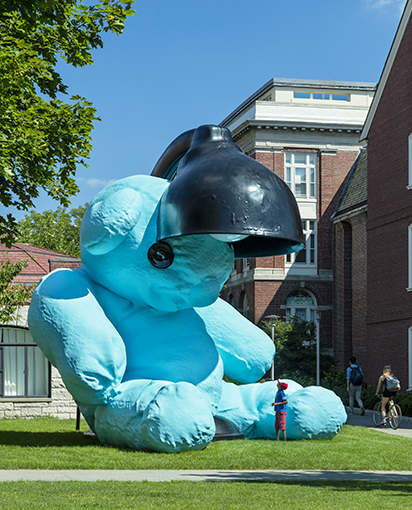 23' x 21'4" x 24'7"
Photo: Warren JaggerUrs Fischer’s monumental 2005–2006 sculpture, Untitled (Lamp/Bear), will be on view on Brown’s campus for five years—a generous loan from the Steven and Alexandra Cohen Collection. 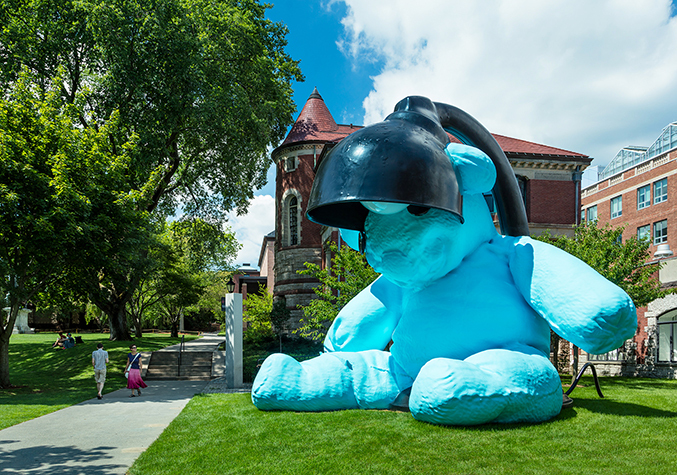 One of a series of three, the baby-blue cast bronze sculpture reaches 23 feet in both height and width. Urs Fischer’s work is rooted in playfulness, with an element of irreverence. Untitled (Lamp/Bear) is from a series of works that explore what the artist calls “the inner mechanics of duality.” He questions, “what happens when two specific objects meet in an imagined space.” The series includes a giant wooden chair straddling a cigarette package, an upended table balancing on a cigarette lighter, and in the sculpture at Brown, an inexpensive Bakelite desk lamp extending from the head of a teddy bear. Audacious and humorous, the sculpture is a nostalgic and larger-than-life presence. Untitled (Lamp/Bear) joins the lineage of sculptures referencing Brown University’s mascot, the Kodiak bear, including the 2013 work, Indomitable by Nick Bibby at the Athletic Complex; Ernest Geyger’s bear fountain at the faculty club; Ely Harvey’s bronze Bruno, located on the main green; Nicholas Swearer’s expressionist bear at Maddock Alumni Center; and the taxidermied Kodiak bear in the lobby of Meehan Auditorium. Urs Fischer was born in Switzerland in 1973 where he began his artistic career immersed in photography, the presence of which remains deeply relevant in his extensive body of two and three-dimensional work. Currently living and working in New York City, Fisher is a prolific maker and has shown frequently throughout the US and Europe. His work has been the subject of several major solo exhibitions in North American and European museums, including a 2013 solo exhibition at The Museum of Contemporary Art, Los Angeles; the New Museum’s 2009–2010 show Urs Fischer: Marguerite de Ponty; and solo shows at the Kunsthaus in Zürich, the Museum Boijmans Van Beuningen in Rotterdam, and the Centre Pompidou in Paris. His work was also included in the 2006 Whitney Biennial and in the 54th Venice Biennial in 2011.